I mentioned a few days ago that we’d started weaning the little man and so far it’s going really well. I got some lovely comments on the post I wrote, so I thought I’d share some more weaning posts, in this case, a check list with some of the things that I consider essential for anyone who is about to start weaning. I’m by no means an expert but I always find a list helps me stay organised and when you have a small baby you need all the help you can get to stay organised and stress free! You need a safe and sturdy place for your little person to sit while eating. We have a Joie Mimzy Snacker highchair which is great. It’s covered in cute little owls and is perfect for our rather small little house. It can be easily folded with one hand but pulling a strap in the centre of the seat. It folds up nicely and is free standing once folded. It sits nicely in the corner of our dining room when it’s not in use. Our highchair cost £50 but you don’t need to spend anywhere near that. 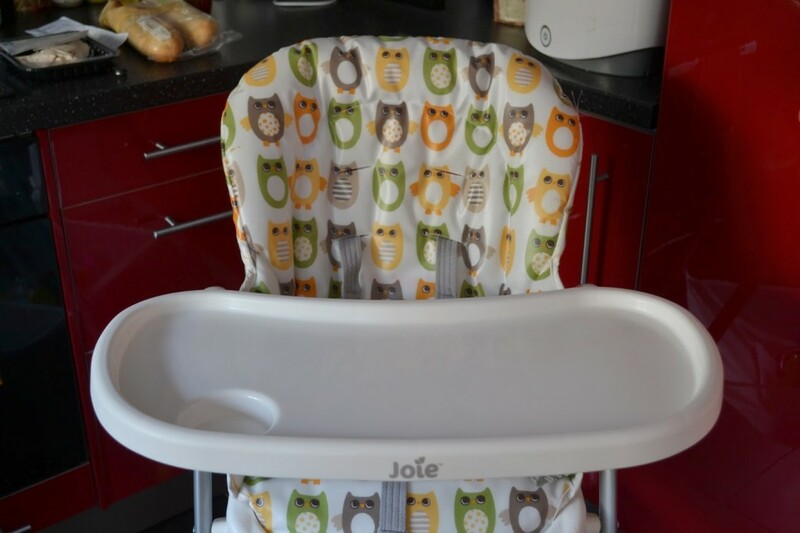 The £16 high chair from Ikea seems just as good and has great reviews and recommendations. 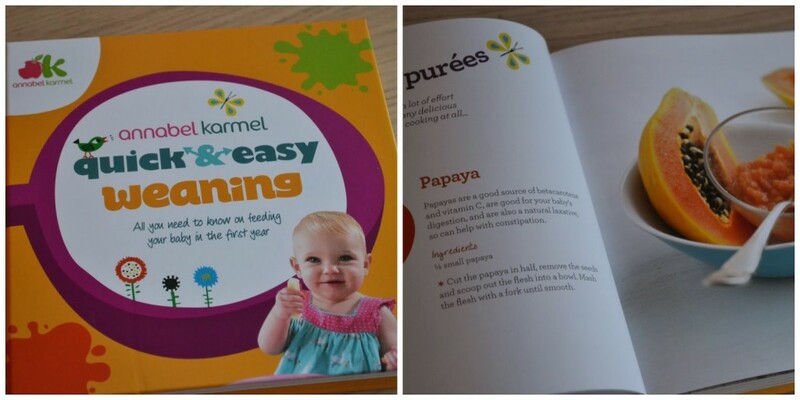 I’ve found this Annabel Karmel quick and easy weaning book* completely invaluable. It gives a simple step by step guide to weaning, how to introduce new tastes and flavours and a vast selection of easy to follow recipes for your little person to try. I’ve done quite a bit of research and reading on weaning and I found this books a real help. It’s given me much confidence to try unusual combinations and introduce meat and eggs quite quickly. I would certainly recommend buying a decent book to help you learn the basics. 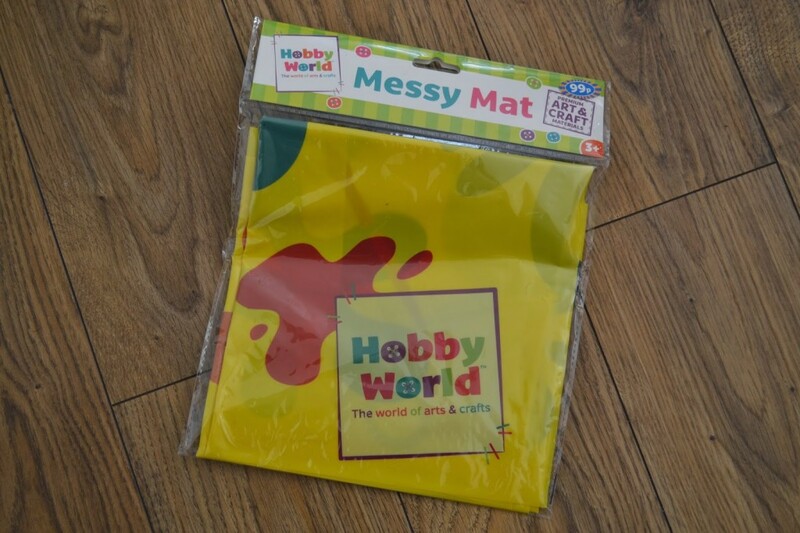 Basically a big plastic sheet to put on the floor surrounding the high chair, it’s absolutely essential if you have a carpet. We feed the little man in the dining room. where we have a tiled floor. Although it’s quick and pretty easy to clean up (unless he’s taken a while to eat and I have dried on, crusty bits of veg to pick off the tiles) a splash mat makes it even easier. You don’t need to spend a fortune. I bought a couple from B & M bargains for 99p each, you could also use a cheap shower curtain from Primark for less than £5. Obviously you’ll only need one of these if you’re starting off with purees, if you’re following the baby led weaning method you shouldn’t really need a blender. If you do want one, there’s no need to buy one of the posh, fancy one. All you need it for is to blend/puree your veg. You can get them from Argos for £4.49. I got ours for free from the weaning class I attended at our local Sure Start centre. When I signed up for the class, I had no idea they’d give us each a blender at the end. It did save us a few pounds though. You will need a good supply of storage containers for individual baby food portions. On a Sunday evening I do a massive batch of purees to last the week and freeze them, it saves any faff. I take one out the night before and leave in the fridge to defrost and then it’s ready when little man is ready for his dinner. 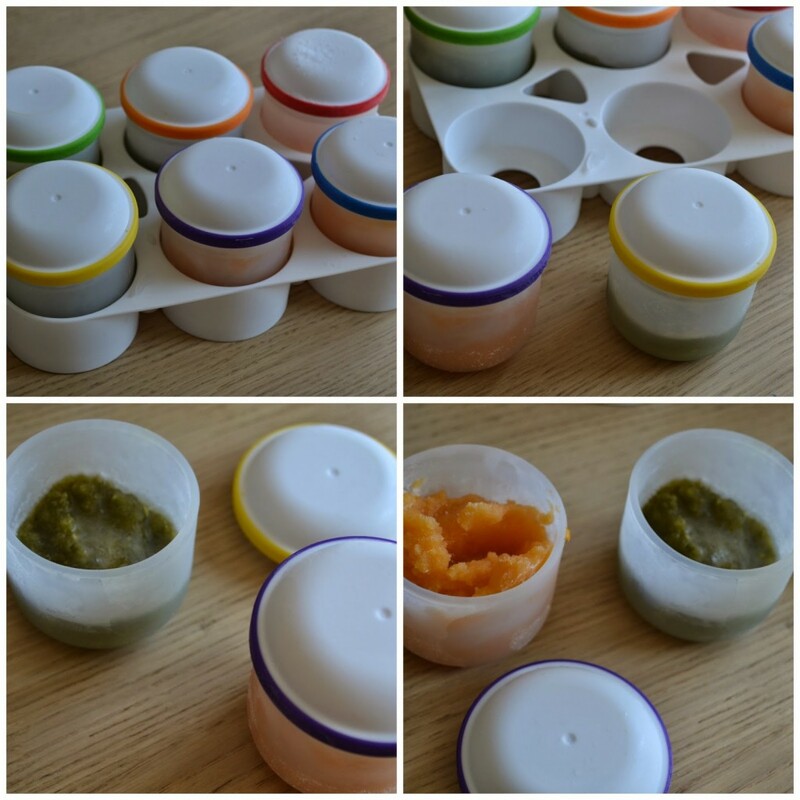 The containers don’t need to be massive and if you can, buy a shape that will stack easily in your freezer drawer.These Dr Browns Designed to Nourish Food Storage Pods* are great. You get six airtight pods which are made from silicone and sit nicely into a stackable tray to keep them together in the freezer. As they’re made out of silicon they are malleable and with a little squeeze the frozen puree easily comes out. These are by far my favourite storage containers. I love the shape and design or the containers and the brightly coloured rims are a nice touch and makes them easy to spot in the freezer. At £19.99 for a set of six they are a little on the pricey side but as with all Dr Browns products you pay a little extra for better quality, plus if you’re quick and click the link above the storage pods are currently on offer at Boots for the bargain price of £5! Feeding bowlsYou’ll need a couple of feeding bowls, ideally some that you can use when you’re out and about. The Oxo divided feeding dish* is ideal. It has a rubber bottom which prevents slipping and sliding on the high chair tray, though little man can still easily pick it up/tip it over/launch it. I love the bright green colour and the dividing section in the middle. It means I can put dinner and dessert out at the same time, without having to leave little man in his high chair. The bowl has a ring around the middle which has a lip to help remove excess food when loading the spoon, it’s handy because I’m usually trying to do three jobs at once, so I can feed little man with one hand if I need too, knowing that the bowl won’t slide about and I can load the spoon easily. The bowl clicks together with a lid for storage or transportation, it is nice and secure in my change bag if we’re having lunch on the go and means I don’t need to carry more than one container. I haven’t actually bought any baby cutlery. I signed up to all the baby groups like Hipp and Cow and Gate and was sent three different lots as freebies in the post. Whilst it hasn’t saved me millions it’s definitely worth doing, plus if you sign up to all the baby clubs they regularly send discount vouchers out, we’ve just had some vouchers through for free Hipp jars and money off Aptamil porridge. You will NEED a good supply of bibs. The bigger the better. The more clothes that are covered, the less of your sanity you lose! We use Asda’s cover all bibs. They’re a complete god send. They mean I can feed little man without him being A. naked other than a nappy, B. have to be hosed down afterwards or C. change his entire outfit. They also wash and dry really quickly and are complete bargain compared to some of there higher end brands. First tastes should be simple and smooth in texture. It’s the start of a whole new world for your baby. The Organix* range is ideal. Month by month during your babies food journey there are different products suitable for both their taste buds and little tummies. 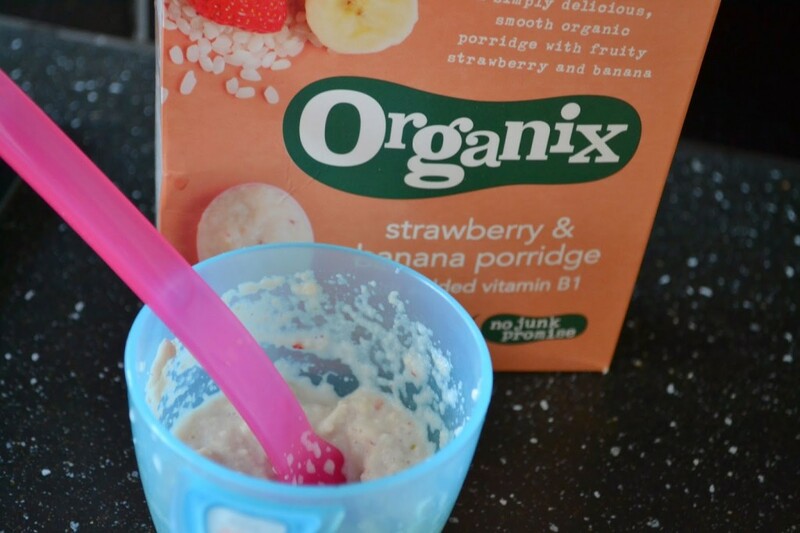 The little man absolutely loves the strawberry and banana porridge, it’s tasty and contains no nasty extras. I wish they did a big peoples version of this! As well as starting to wean, we’ve introduced some ‘proper’ drinking cups for little man. During meal times he gets water in a cup rather than a bottle. 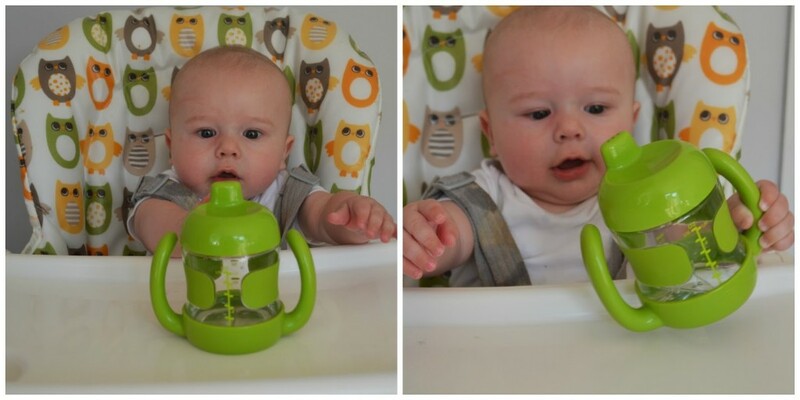 We’re using the Oxo sippy cup with handles* which is brightly coloured and has easy to grip handles for little hands. The handles are removable, so when little man gets older he can continue to use the cup as a beaker. The cup is leak proof which means no soaking wet clothes. I really like the design of the cup, it’s simple but looks really modern and eye catching. The cup is really simple to wash and is also dishwasher friendly. Little Man worked out how to use the cup really quickly and can easily raise it to his mouth with just one hand. The only issue I have with the cup is I think it could be a little more protected. The plastic feels quite brittle and I think if the little man threw it hard enough off our stone floor it’d either shatter completely or crack. We’ve been alternating between the Oxo cup and a Doidy cup* which I think is a completely ingenious invention. It’s such a simple yet effective idea. The cup looks quite similar to a standard beaker but has a slanted rim which allows little people to drink easily without having to have too much of a tilt or move their head about too much. The Doidy cup teaches little people to drink from an open cup at an early age and helps learn them how to pick it up and put it down correctly. 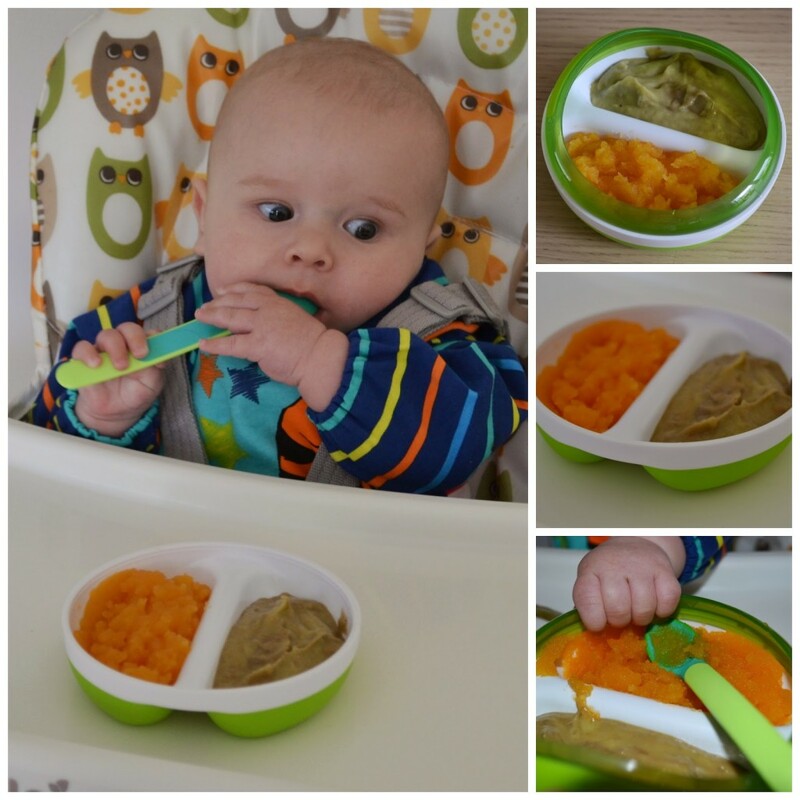 It can be used from the age of 3 months, and should actively encouraged from 6 months during weaning. The first time we tried it, I put a small amount of water in the bottom and instinctively knew how to raise it to his mouth. Don’t be under any illusions, your little person/floor/high chair is going to get very wet. As with anything, it’s takes time to get used too but in the matter of a week little man seems to have the knack, and spills much less and can easily pic up the cup, raise it to his mouth and take a drink. I really like the Doidy cup but I feel the rim could be a little softer for little mouths. The edge is quite sharp and as little man is teething he does tend to ‘gum’ it a bit when drinking and I worry he’s going to hurt his gums. A travel high chair – I suppose it depends where you’re going. So far, we haven’t had the need for one as any restaurants or cafes we’ve visited have been able to supply one. Ice cube trays – It’s recommended that you start making purees in ice cube trays, personally I bypassed this stage. Little Man wanted to eat decent sized portions straight away so we started on normal storage containers from the start. A decent guide/recipe book – We have the Annabel Karmel one which is great. Read online or check out blogs about weaning – It’s always nice to read about other peoples experiences and opinions. It’s a great way of picking up helpful tips and ideas. Antibacterial spray – I am a little obsessed with keeping the high chair and tray clean. fabulous post – a must read for all mums about to start weaning. I've heard about the doidy's myself before – first review I've seen though – thanks for sharing! 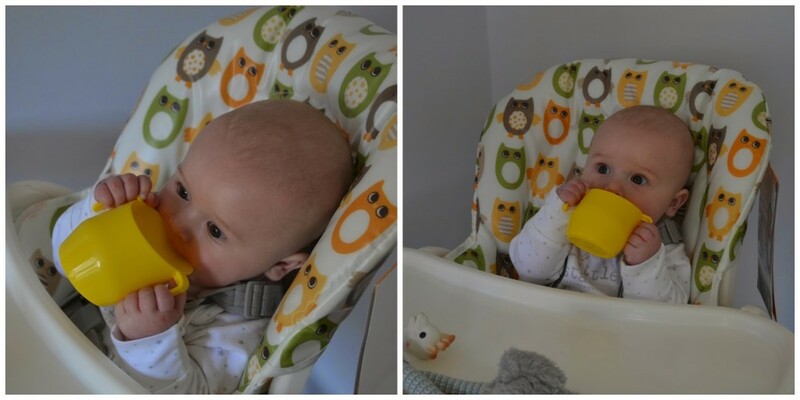 Such a great post I'm pretty sure you've got all bases covered for weaning! The pictures of your little one are adorable! I love the high chair too – I'd happily have cushions in that fabric! I can't really comment on the weaning as I don't have my own children but my friend is weaning her baby at the moment and there's an awful lot of squishing of fruit and veg going on. I love watching babies as they discover new tastes and textures, they're little faces are so cute! Such a cutie pie! I love these weaning essentials and I wish I bought a splash mat before! omg, the mess. Those little containers are pretty cute too, I think we had a similar one back then. Its nice post ! thanks for sharing this information.nebosh courses in chennai|Iosh course in chennai|fire and safety courses in chennai keep post!.